Next month promises a unique enthusiasm among Bruce Springsteen fans. Sparked by the October 2 release of his new album, Magic, Springsteen will embark on his first concert tour with the E Street Band in nearly five years. Within the midst of that excitement, a new documentary about the Boss will hit retail shelves on October 9. Bruce Springsteen: Under Review 1978 – 1982, Tales of the Working Man examines the work that Springsteen wrote and released over the span of three pivotal albums: Darkness On the Edge of Town, The River, and Nebraska. In this 82-minute analysis of, arguably, the most prolific phase of Bruce Springsteen’s career, journalists including Robert Christgau and Anthony DeCurtis offer critical insights along with assorted Springsteen biographers, Backstreets Magazine editor Chris Phillips, and Vini Lopez of the original E Street Band. As well, vintage clips of Springsteen on stage and in interviews are thrown in for good measure. 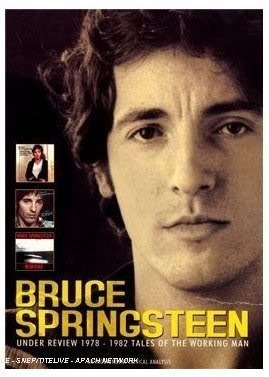 The documentary frames the discussed trilogy within the context of what album preceded it and what album followed, which consists of Born To Run and Born In The U.S.A., respectively. By unanimous consent among the commentators, Born To Run signaled a watershed moment in popular music, one that summoned the spirit of early rock and roll as it yielded a new language to the songwriting lexicon, with lyrics that read like literature on the page and sounded cinematic blasting out of car radios. Also a consensus is that Springsteen realized how his effort had set a high precedent for himself. One factor he didn’t bank on, though, was litigation with his former manager that would put him, in his words, “out of commission,” for three years. In 1978, following his three year prohibition from recording new material, Springsteen released Darkness On the Edge of Town. Described in this documentary as the sound of hope and dreams colliding with the cold, hard truth of life, this album presented Springsteen as a more concise and, ultimately, a more grievous storyteller. For a guy who was previously “pulling out of here to win” on “Thunder Road,” songs like “Badlands,” “Something In The Night,” and “Factory” illustrate that winning does not come easy, if it ever comes at all. According to Chris Phillips of Backstreets Magazine, Springsteen subsequently intended to release an album entitled The Ties That Bind, but he scrapped the project because he felt it was “too personal” as it addressed issues of men and women. In its place, Springsteen eventually released a double album, The River, in October 1980. Commenting on some of the lighter fare of the album, DeCurtis offers a perceptive view, which he says Springsteen once agreed with him on, that it’s those songs that the album’s characters would’ve listened to in their respective lives. Such an acknowledgement by Springsteen underscores the depth of thought and detail he instilled into the creation of his albums. With the release of Nebraska in September 1982, Springsteen created his darkest and most desolate landscape yet in which to set his narratives. On songs like “Atlantic City” and the chilling title track, characters that are “tired of coming out on the losing end” resort to violence and murder to make ends meet. Borrowing a phrase from Southern novelist Flannery O’Connor, the serial killer in “Nebraska” rationalizes his murder spree by squarely saying, “Sir, I guess there’s just a meanness in this world”. Following a pattern that he would maintain to present date, almost to the letter, Springsteen followed up the stark sounds of Nebraska with a full-scale rock record. Born In The U.S.A. introduced Springsteen to an even wider audience, yet it also attracted a myriad of misconception. For serious fans, Bruce Springsteen – Under Review 1978 – 1982 Tales of the Working Man will suitably compliment your overflowing collection of Springsteen music, videos, and memorabilia. Sure, you may already know some of the basic facts that are addressed, but the thorough analysis contained within this documentary will certainly put this era of Springsteen’s work into a sharper context and, for that, it’s well worth watching.